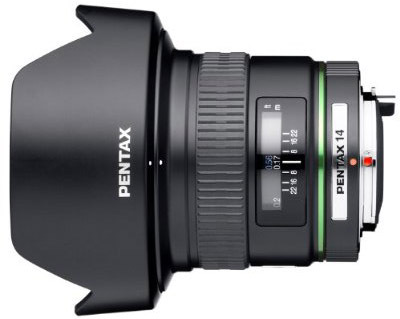 The Pentax SMCP-DA 14mm f/2.8 ED Lens is a wide angle lens with an internal focusing system for smooth, fast AF. It is compatible with crop sensor Pentax K mount cameras and is ideal for landscapes, interiors, vistas, and candids. • This lens is compatible with Pentax K mount cameras with crop sensors only. It will vignette when paired with full frame sensor Pentax cameras. The equivalent length on crop frame sensors is 21mm.